Pom poms are really fun to play with. Just by touching the colourful pom pom gives sensory stimulation for little ones . For grown up toddlers, picking up pom pom and putting it in necessary place will be great activity to keep them engaged. Pressing the clothespin requires greater use of hand force which enhances the motor abilities of kids . 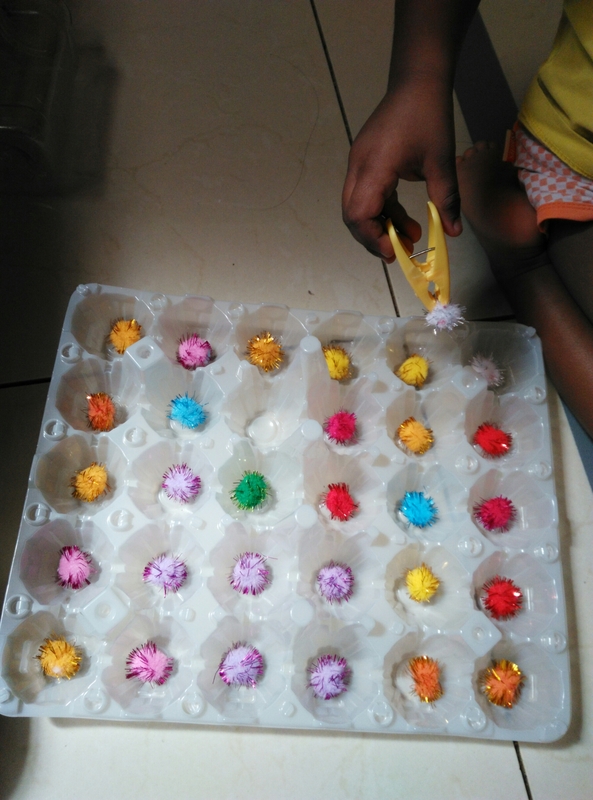 Picking up pom pom and dropping in specified hole of egg carton involves fine motor skills. This is great activity to improve both. Variation of this is to pick and drop the pom pom in container, separate it by colours. Identifying alphabet is fun game u can play anywhere . The alphates we can come across in snack wrap, sign boards, even in their dresses . 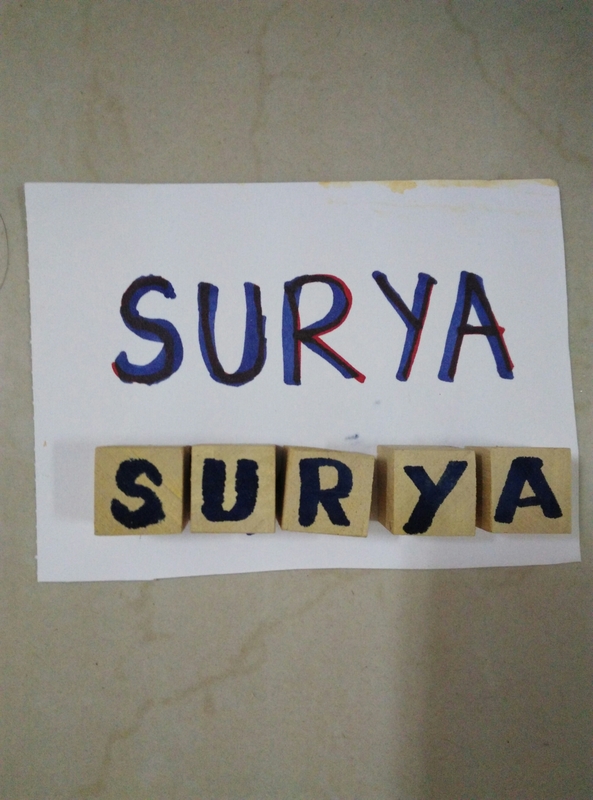 So teaching them letters is the beginning for many fun timepass. For a 2 year old it is not possible to teach entire alphabet set. So beginning with the letters of their name is good start. They will be interested to identify the letters of the word which they have been hearing from birth and very familiar with. Here is one way to teach their name letters. Get craft wood and cut them into cube . Write each letter on one cube . Juggle it and ask the child to arrange it . Slowly repeat the letter again n again until they are able to match it with ease . Within one session of this arranging activity my son was able to identify these 5 letters anywhere. So cut as many cube , write as many letters, show them their favorite words and the fun time begins!! Pattern blocks are interesting thing to play with. 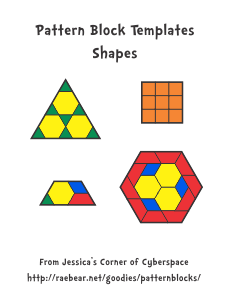 Pattern blocks consists of shapes such as hexagon, trapezoid, rhombus, triangle, square and diamond. 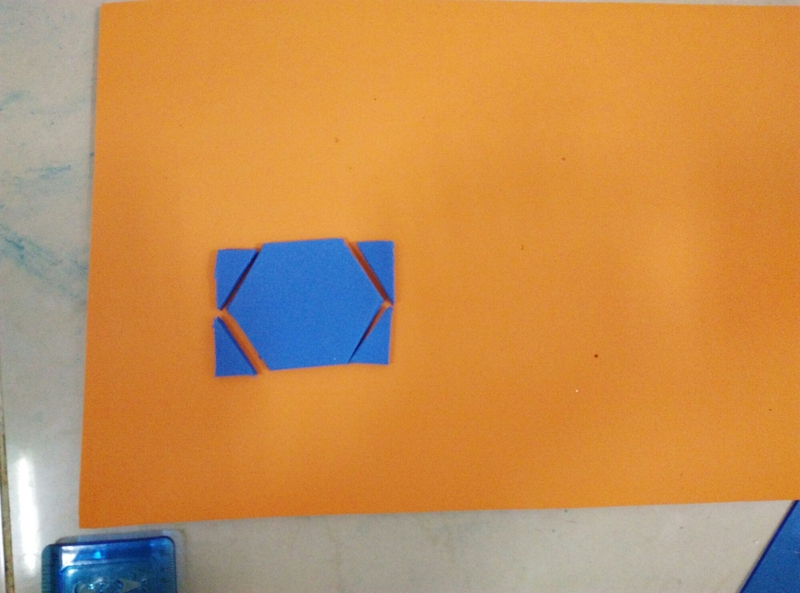 These block shapes are used to fill up a template which leads to many creativity. Pattern templates can be made in many possible ways based on the age of kid. Template can be as complicate as animal to as simple as reactangle. In case of rectangle it can be made with traingles or squares or hexagons or combination of several shapes. Similarly each template is filled with any shapes thats mentioned. In the picture above, Rectangle is constructed with one hexagon and 4 triangles. Each shape can be of different colours for versatility. Generally the shapes are made up of wood or craft foam sheets. 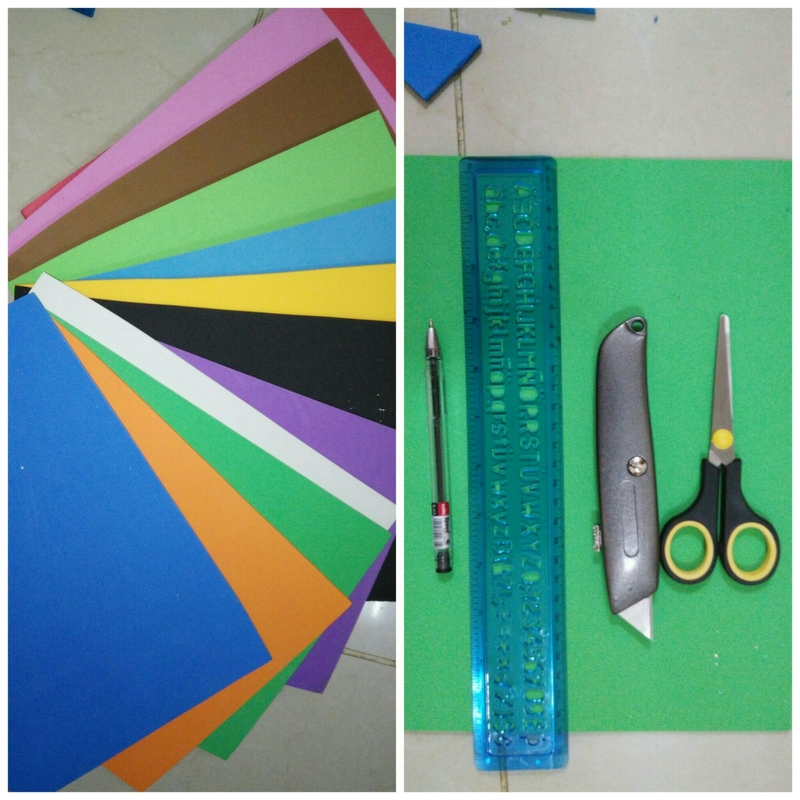 Here I will explain how to make shapes out of craft foam sheet . Craft foam sheet A4 size of thickness 5mm. Draw a hexagon of side length 5cm on a paper preferably graph sheet for easy drawing. Cut it out. Trace the shape on foam sheet. Using sharp knife cut out the shape from foam sheet. 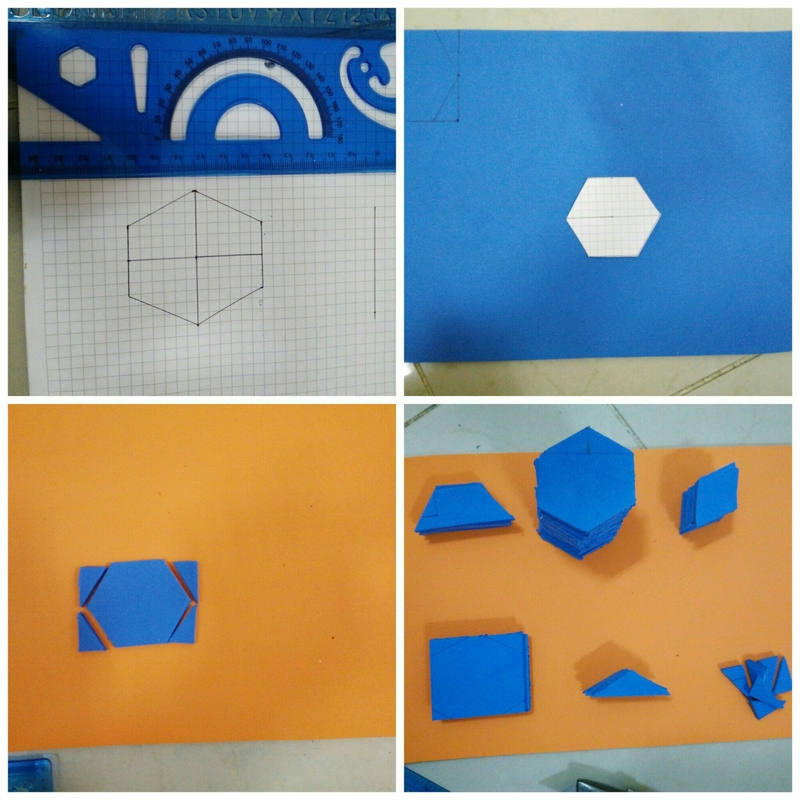 After cutting hexagon on a A4 size foam sheet there will be free space left which is not sufficient for hexagon but other shapes lik trapezoid and rhombus can be cut. Important point to be noted is that the side length must be same for all the shapes. Toddlers can match shapes with board marked with outlines, sort by shapes or colour. Preschoolers can use simple tempates like using squares to make rectangle, trapezoid to make hexagon, triangle to make square, etc etc. The pattern is endless . Get creative to keep them hooked to the activity. Soon will update collective templates for kids of different age group. For now enjoy making these shapes at home . Handmades are always special and this will be worth the effort. Ps: For those stayin in Saudi , these foam sheets are available in all 2riyal shops here. I got these in zeenat ahlam store near Redtag and Farm superstores.